Last week saw me receive some exciting post, more exciting then bills which we normally get. Last week I discovered I had been chosen as a #MorrisonsMum. So teaming up with Britmums and Morrisons, we were armed with £80 worth of vouchers to shop at the 'new cheaper Morrisons'. We’ve cut the prices on over a thousand of your favourite products. Not temporary reductions or supermarket smoke and mirrors, these are new every day low prices on the things you buy every week. So you’ll notice the difference with every shop. I was intrigued to learn if this was true, had they been increased before hand to make way for the new cuts or not? Also, I was intrigued to learn if it was on a range of food types and not just extra buys such as crisps or chocolate. As it was the bank holiday weekend, we decided to spend time with family and have a barbecue so this meant purchasing more food with an army to feed. So 8 adults, 1 toddler and a barbecue to sort, we set about getting our shopping. It was clear to see from the car-park and on entering the store the changes, seeing lots of promotional material, more than normal around. Also when entering into the store there were lots of promotional stickers and signs. When walking around we were greeted by lots of the yellow I'm Cheaper signs, which is fab to know. 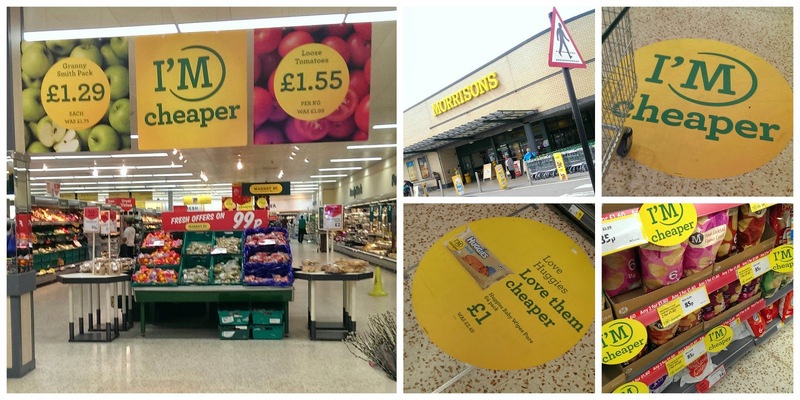 Many prices have been slashed at Morrisons. I even compared them with my future father in law,who agreed Morrisons products are a lot cheaper now then Asda. (sssh I didn't say the competitor). We did two trips to Morrisons, one with future father in law for barbecue items and then another for items for a meal for ourselves. Theres nothing I love more than a barbecue at the in-laws, hence them cooking it. It is very meat heavy as there are lots of meat loving males. So we have a selection of beef burgers, sausages, rump steak, pork loin and chicken wings. All of the meat came to £38.64 with purchasing only the best quality meats this maybe bumped this up a little more. Salad for this came to £5.83 and cheese costing £4.01, did I tell you they love cheese too. The remaining £10.80 we spent on barbecue food going towards the bread, eggs, coleslaw and some drinks and items for a trifle with fresh fruit. I feel that is money well spent, £59.82 for the barbecue food, which to some may seem a lot, however normally when having a barbecue we would spend normally £80+. On our second Morrisons shopping trip we went armed with our shopping list for a picnic lunch and tea. For our picnic lunch we purchased wraps, chicken, salad and snack pork pies, pasties and scotch eggs. This totaled £8.95 feeding 6 with food remaining afterwards. For our tea we had roast belly of pork with apples and sage, serving 4-5 people. Purchasing items for this, apart from what we already had at home (herbs and spices) this came too £12.06 with vegetables to accompany, this works out to roughly £2.42 per person. I am definitely impressed with this experience of Morrisons, we had begun shopping in different shops as I felt Morrisons was no cheaper however I've been proven wrong by this experience. We will be continuing to shop at Morrisons especially for the meat. The quality of food and taste was very impressive and definitely a shop I would recommend. In fact I already have with the price changes. Please Note, we were provided with £80 worth of Morrisons vouchers for this shop, all opinions, beliefs and experiences are my own and not influenced. That barbecue food looks delicious! 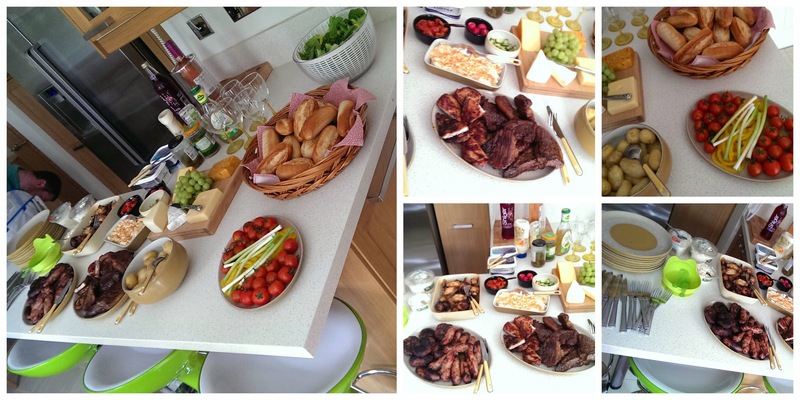 Looks like an amazing spread.